There's nothing like sewing a garment that can give one a visual illusion of having a flattering figure, a nice neckline that takes one's eyes away from problems areas, also a window to showcase a nice piece of jewelry. 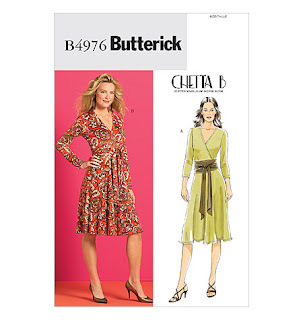 That's what I like about Butterick 4976 faux wrap dress with a semi-fitted bodice, slightly flared skirt, side zipper, attached contrast or self fabric sash with long ties and seven-eighths or long sleeves. This is my fourth go-round with this pattern which has become my TNT. Here are the reviews for the first, second & third versions. 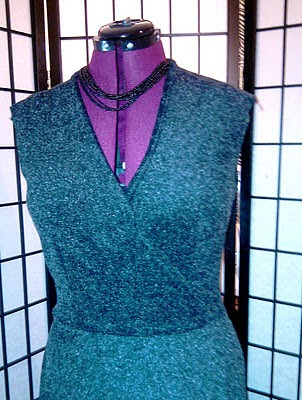 The garment was sewn with a black mohair knit from Joann's $4.00/yd. It is lightweight & uber soft and to my surprise has a nice drape, although I initially was concerned that it may be too lofty and clingy. 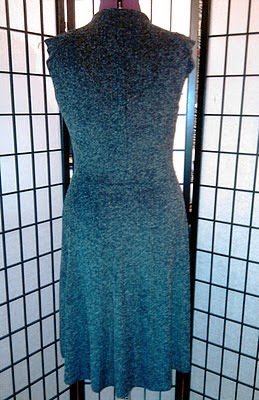 In versions 2 & 3, I did not put in the darts since I'd used a medium weight knit, but for this dress I inserted the darts, again no zipper and I did not make the sash... not enough fabric. All the seams were serged and the back has a center back seam, again due to lack of fabric. For the neckline I used 1/2" clear elastic, which I sewed to the neckline before applying the facing. The previous versions I used 1/4" clear elastic and it was a little persnickety to work with. Also, I lenghtened the bodice. In the previous versions, I noticed that as long as I wore the fashion fabric belt it covered the waist seam because the belt was wide. 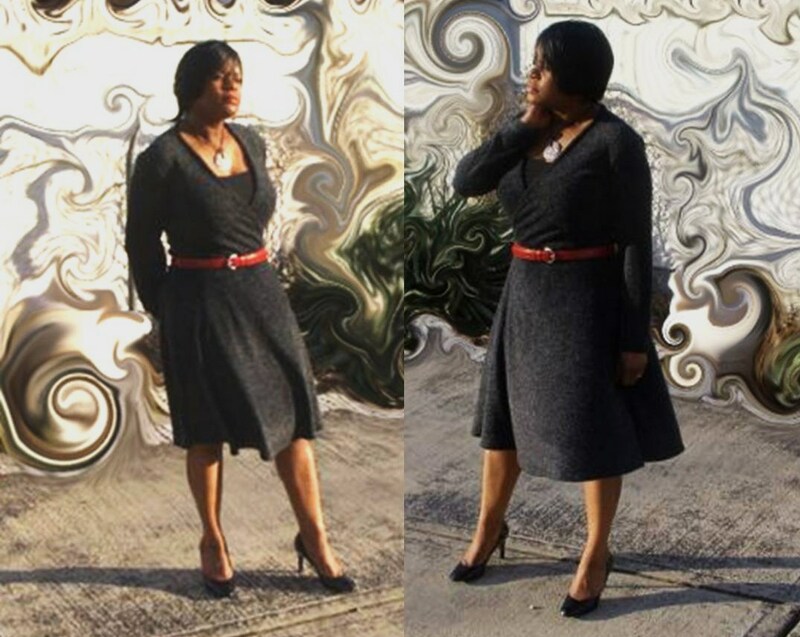 However, when I opted for a narrow belt, I had the issue of the waist seam sitting above the belt and constantly tugging on the dress to keep the belt in line with the waist seam. After reading Jackie's post about being short-waisted and lenghtening bodices on her dresses, I took her cue and did the same.... much better. Thanks Jackie. 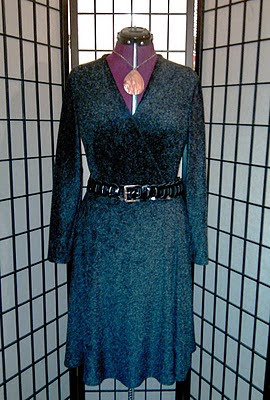 Also check out Jackie's lovely 2 piece outfit made in the same fabric. Conclusion another great dress added to my wardrobe. GORGEOUS. I love that fabric. Very flattering dress. Now this is a great TNT pattern! Each version looks different from the original but the styling is similar and works for your body. Another wonderful version. Wonderful! I love your sense of style--classy but not "old ladyish." Yep, this a winner. Flatters your already fabulous shape. really like the dress.. How did you get the wind to blow just right for your pictures though! I like it. I love my wrap dress so much that I picked up another fabric to make another one. Love that look, you look so good in the wrapped style. Fantastic dress, great TNT pattern, each one unique. Super cute, love the fabric and accessories. Looking great as usual S! your dress turned out FANTASTIC! I love that fabric. Beautiful! Your dress turned out lovely! And it is always interesting for me to see what someone will make with the exact same fabric. Great work as always and thanks for the shoutout. 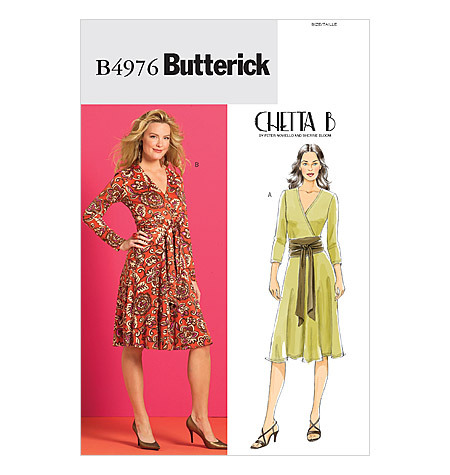 Beautiful dress and wonderful fabric choice! Ooooh, pretty! It looks great with the red belt and the shoes. 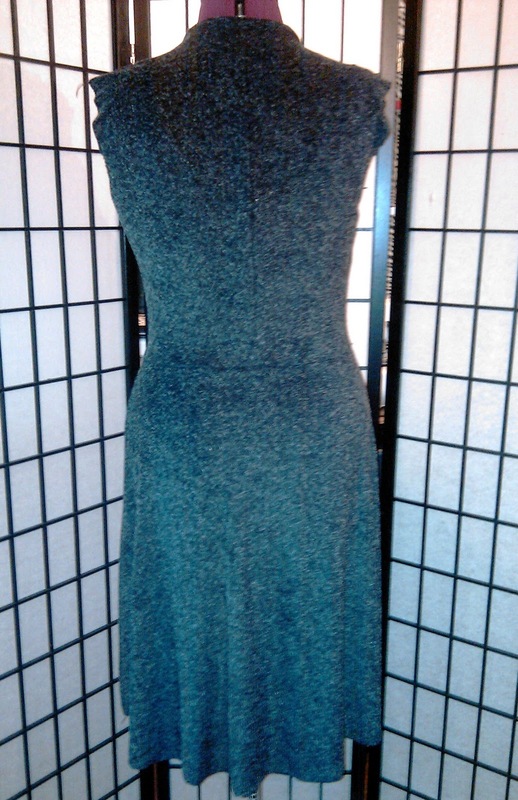 This dress has always flattered you! Well done again! That's a very chic dress! Looks fabulous on you. I love the pop of red belt. It great having the TNT patterns that are perfect for you. This one is very flattering. Wrap dresses and tops are favorites of mine too. Gorgeous. You look like a page in a fashion magazine. I love that dress Sheila. That's definitely one that you can pull out again and again. It's looks great on you too!